"Transfer iBooks from iPad to Mac – I downloaded PDFs to iBooks on iPad and they won’t sync to Mac. How to transfer iBooks from iPad to Mac?" – From Apple Support Communities. Many iPad users have such kind of questions when they use iBooks on iPad for reading. Some of them need to know how to transfer iBooks from iPad to Mac or Windows computer for either backup or data sync. Actually, this is very easy task for iPad users. This post would show you different ways on how to transfer books from iPad to Mac computer. In this way, you will be able to sync all books you’ve purchased and downloaded from iBooks store on your iPad to Mac computer. Some books you’ve downloaded from other places including PDF and EPUB files might not be included. You could then follow the below steps to learn how to transfer iBooks from iPad to Mac. Connect iPad to Mac computer and launch iTunes on your Mac computer. Launch iTunes on your Mac computer. 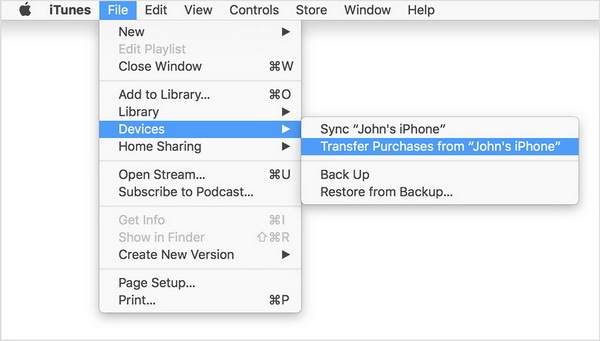 Open "File > Devices > Transfer Purchases" option. 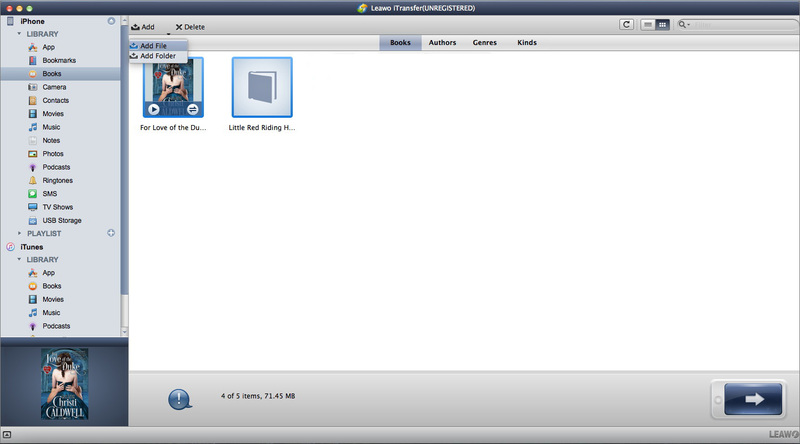 iTunes would then import all purchases from iPad to iTunes, including books (PDFs and EPUBs are also included). Launch iBooks on Mac and then open "FIle > Move Books From iTunes" option successively. Now, all the books on iBooks of your iPad would be transferred to Mac iBooks. You could now easily view books on Mac iBooks. 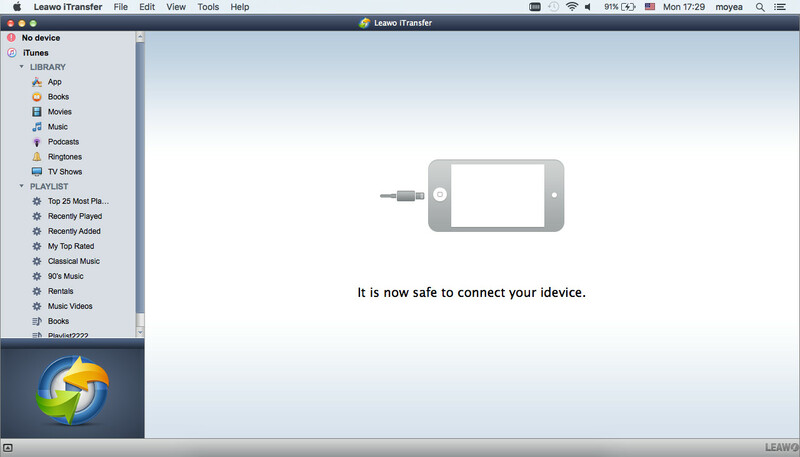 Leawo iTransfer for Mac is a 3rd-party iOS data transfer software app that could help you transfer data and files between iOS devices (iPhone, iPad, and iPod), iTunes and computer. With this iOS data transfer app, you could freely transfer any books in iBooks on your iPad to Mac computer as you like. Download and install this iTransfer on your Mac computer. The below step-by-step guide would show you detailed operations on how to transfer books from iPad to Mac with Leawo iTransfer for Mac (here we take iPhone 6 to replace iPad). Right click the books you want to copy from iPad to Mac and then choose "Transfer to > My Computer/iTunes" option. Then, there would pop up a window to let you choose output directory. You could choose to either transfer books from iPad to Mac computer or copy books from iPad to iTunes on Mac as you like. 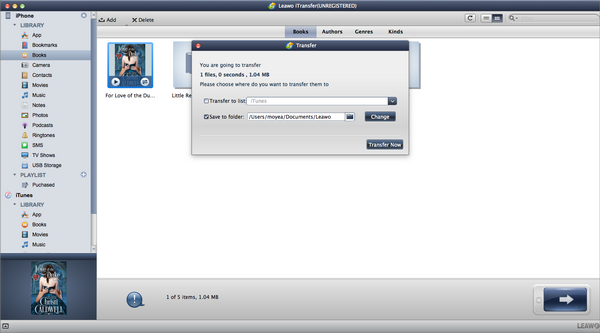 After that, click the "Transfer Now" button to start the process of copying books from iPad to Mac. Open iBooks app on your iPad. Navigate to the book you want to transfer from iPad to Mac, and then open it. At the upper left corner, you could see a menu button, by clicking which you could get to the brief introduction page of this book. On the top-right corner, click the share icon with an up-pointing arrow. Then, choose share with email. In the receiver box, input your own email address and then send this mail. On your Mac, log in with the email address you’ve set as the receiver in the last step. Open the mail and choose to open with iBooks. Then, the books would be downloaded to iBooks on Mac. Obviously, it would be convenient and easy to copy books from iPad to Mac computer via email. However, you should have noticed that you could only transfer one book from iPad to Mac at a time.